Have you ever seen an act which is so nerve racking that it virtually sticks in your craw? Perhaps no other performance piece in the world of entertainment fits that description quite as well as the eeeewwwh-inspiring art of sword swallowing. Last Saturday, upwards of 100 sword swallowers showcased their delicate skills at Ripley’s Odditoriums around the world for the 8th Annual World Sword Swallowers Day. Conceived as a way to honor the art while promoting sword swallowing and showing the public how the skill is performed, the event happens the last Saturday of February each year. 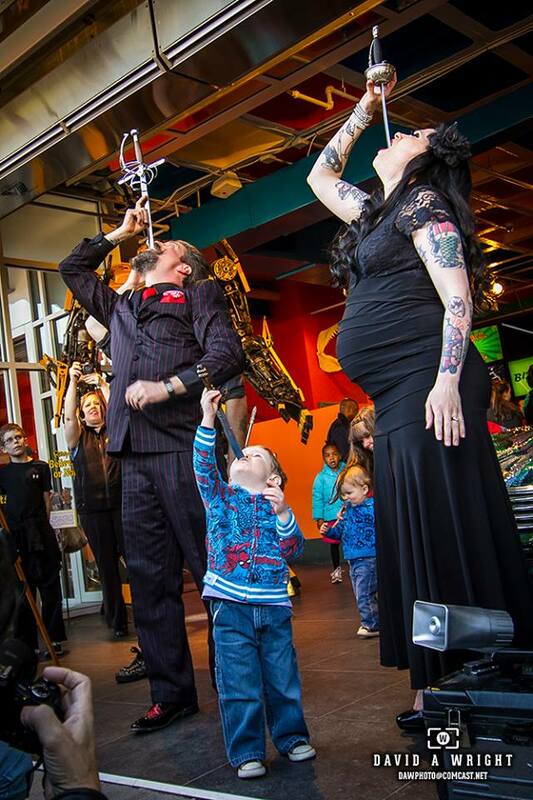 Filling the bill at Baltimore’s Inner Harbor location of Ripley’s Odditorium were three of the best in the business: Christopher Scarborough, Tyler Fyre and Thrill Kill Jill. Scarborough told the Baltimore Post-Examiner his appearance here in Baltimore marked his 3rd year at World Sword Swallowing Day. “Sword swallowing was first exhibited in America at the 1933 World’s Fair. I started back in 2007, and it took me about six years to actually be able to get a sword down. I finally succeeded about a month before my first appearance here at the Odditorium. A Pasadena, Maryland native, Scarborough has lived around Baltimore his entire life. 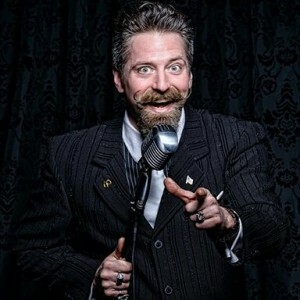 Scarborough is a familiar face on the local side-show circuit; appearing regularly as a street performer and in the Baltimore – DC burlesque scene. He also teaches sideshow, and counts up-and-coming performer Shaggy Wilcox as one of his students. “We are a very small group of friends and colleagues. There only a few dozen sword swallowers throughout the world. Along with the obvious sideshow aspect of the event, WSSD provides a chance for the audience to learn the way art has impacted science. What’s the longest sword a person can swallow? 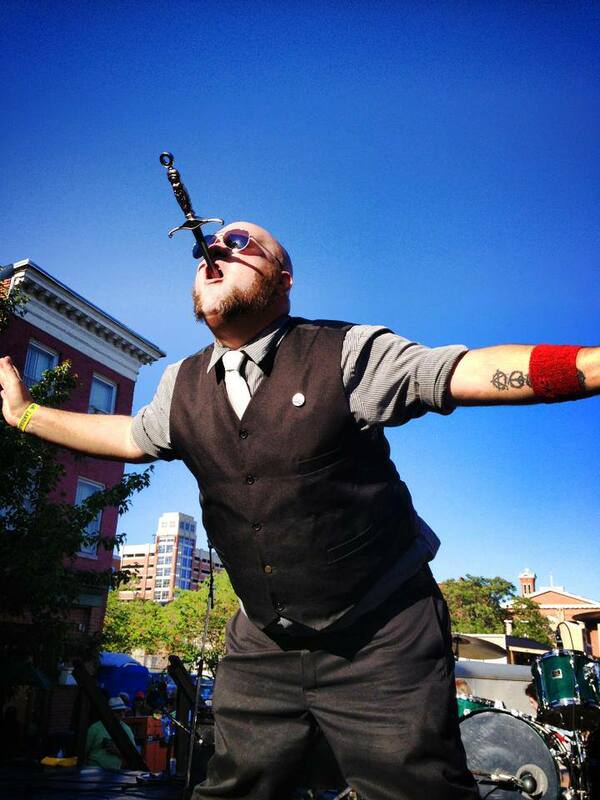 For Scarborough, sword swallowing is a decidedly one-man act. For Tyler Fyre and Thrill Kill Jill, the art is a family affair. Fyre has been swallowing swords since 2000. His wife Jill has been at it for about eight years. Fyre said the longest sword he can swallow is 27 ½”. Fyre said that to get 100 sword swallowers for the various events around the world, Ripley’s had to reach out to retired performers and people who don’t do sideshow as a profession. To fill his act, however, Fyre only had to reach for the hand of his wife – Thrill Kill Jill. A Fairfax, Virginia native, Jill met Tyler in 2006, when he appeared at the Birchmere Theatre in Arlington as MC for Angie Pontani’s Burlesque-A-Pades. The couple dated for exactly one year and then married. That was when Jill jumped into the act. Jill said the couple toured for about four years with their own show before starting their family. And in true show business fashion, each child has his own stage appropriate name. All three boys were present at the Odditorum, and the two oldest joined Jill and Tyler on stage. Christopher Scarborough will appearing at The Black Cat in DC on March 20 in A Night of Tiki Culture. More information may be found at the Facebook Event page. More cutting edge information about Tyler Fyre and Thrill Kill Jill (including upcoming shows) may be found at Lucky Daredevil.